And by the NFL I mean Roger Goodell the league’s commissioner. Just a few days ago when asked why he or no one in his organization had seen the infamous Ray Rice elevator videotape, Goodell said this to CBS News. But according to the AP the law enforcement official played a 12-second voicemail for them from an NFL office number on April 9th confirming the video had arrived. What’s even more terrible is what this means for the NFL if they did indeed receive a copy of the tape. It means that they are either lying or that their was egregious incompetence inside the league’s offices where the tape was not passed on to Goodell or any of the higher ups. The latter is hard to believe considering the gravity of the situation and the magnitude of the consequences. Either way it is not good for Goodell or the league. What’s interesting is that Goodell has used his lack of knowledge about the tape as a reason to excuse his woefully meager punishment of Ray Rice with a two game suspension that only after public outrage eventually turned into a six game suspension. It should be noted that two years ago Goodell told New Orleans Saints management that ignorance was not an acceptable excuse or defense during that team’s infamous Bountygate scandal. It should also be noted that in the past Goodell has fined and disciplined players who broke rules and tried to use the same ‘but I didn’t know’ defense. A former FBI head is now launching an independent investigation. If Goodell did see the tape and lied, it is over! After this potential bombshell from the Associated Press, some of his staunchest defenders who dismissed calls for his resignation are now demanding he step down. Roger Goodell has a lot of explaining to do. His credibility is descending faster than the disgraceful elevator ride where this all started. At this point he may be doing more damage to the NFL than Ray Rice. Let’s be very careful what we ask for in this Ray Rice NFL controversy. I do not believe the interests of justice are served by requiring businesses to punish employees for violations of the law. Should this precedent that liberals are pressing on the NFL continue, it will rebound with devastating effect on communities of color. Notice, Don expressed no concern for the well-being of Janay or women who may be victims of domestic violence. His concern is about the damage to the NFL’s reputation. Don is quick to justify any type of brutality against Black women or he is completely silent on the matter when it comes to issues against Black women. For all of Tavis Smiley’s transgressions, at least he had the courage of his convictions. 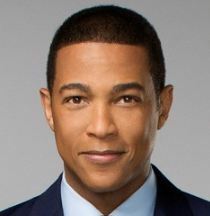 Don Lemon has no convictions. He is NOT a prophetic voice of the people. He is NOT a leader. He IS a cowardly, spineless, passive aggressive, opportunist who is only concerned with self-promotion and the only thing this coward makes me think is that the TJMS made a bad decision in hiring this coward who does not deserve to be called a man. Don Lemon, and the rest of the media, is doing everything in their power to take the focus off of Ray & Janay Rice, both of whom, I blame for this entire mess. The NFL, probably felt like they were in a no win situation, they probably did see that awful tape, and was to afraid to deal with Rice harshly, for fear of being called racist, especially after the Donald Sterling scandal. The NFL, should not have to baby sit these grown men. Ray Rice, signed a 40 million contract, many of us will never see that kind of money in 3 life times, and this idiot, and his stupid wife ruined everything, and now, Janay, also is trying to blame the media, she and her husband were both behaving like a couple of fools, out in public, screaming, spitting, and hitting one another. Ray Rice deserved to be fired! First of all, I’m not a man, I am a black female, and I don’t condone violence against any one, that’s why, I blame both of them, these two idiots were out in a public place fighting like cats, and dogs. When that dog spit in her face, that’s when this woman should have had the good since, to turn around, and leave is black behind there, but she followed him into that elevator, and still begin to argue with this 230 pound, that woman is fortunate that he didn’t kill her, and to make matters worse, after he knocked he out cold, he just stood there looking at her, while a staff member of the casino, actually come over to comfort her. Don’t forget, it takes two to fight, like it said, she should have walked away, but instead this stupid want, marries this lying, abusive, cheater just a month later, what kind example is she setting for her daughter? What makes me sick, are women like Janay Rice, this woman, have family, and friends, and other resources, she is and educated woman, but like they say, there nothing worse than an educated fool. I bet any thing, these two idiots were fighting over another woman, believe me, and woman don’t get that mad, because, a man leave his clothes on the floor, when are woman, and men going to realize, that fussing, and fighting aren’t going to change these people, once a cheater always a cheater. BTW, I guess you missed the press conference, when this innocent woman admitted that she was partly the blame for this miss, so there, the victim, blaming herself. respectfully disagree with you , and it is really apparent that you fail to address the proportional aggression, and that Ray Rice is a Super pro.athlete who has massive power advantage. You seem to cleverly hide that you support Ray Rice by continuously assigning partial blame on Janay I find that so disgusting for a person like you who is very intelligent but not fair or compassionate towards abused Black Women who are disproportionally victims of violence by men. You can exercise your right to use you concealed firearm to kill or stop you assailant . In The Ray Rice vs Janay You could then justify Ray using his “Weapon” to knock out Janay since she was lunging towards him after he spat in her face 2 times. We can go around in circles about this issue forever, but this going to be my last post on this issue. I despise men that hit woman, but I also despise women, who stay with men that hit them. I am very much aware of the size difference between that idiot Ray Rice, and his stupid wife, but that didn’t seem to matter to her on bit, she kept coming at him. I don’t have any sympathy for women, who repeatedly return to their abusive relationships, or who marry their abusers, these dangerous relationships never have a happy ending. I tell you now, 5 to 10 years from now, these two people want even be married, she only married this idiot, to save his behind from jail time. Don Lemon, and the rest of the media, is doing everything in their power to take the focus off of Ray & Janay Rice, both of whom, I blame for this entire mess. The NFL, probably felt like they were in a no win situation, they probably did see that awful tape, and was to afraid to deal with Rice harshly, for fear of being called racist, especially after the Donald Sterling scandal. The NFL, should not have to baby sit these grown men. Ray Rice, signed a 40 million contract, and this idiot, and his stupid wife ruined everything, and now, Janay, also is trying to blame the media, she and her husband were both behaving like a couple of fools, out in public, screaming, and hitting one another. Ray Rice deserved to fired!